Advanced Machine & Engineering (AME) in Rockford, IL, announces the appointment of Chris Koehn as Business Unit Manager for the Stotz product line, recently acquired by AME under a master distributor agreement with the parent company in Germany. 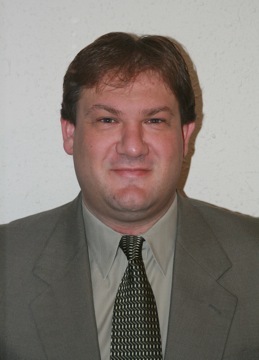 Chris has over 20 years of sales and marketing experience in the machine tool industry. In his new position, he will focus on marketing the Stotz products, which include air and electronic gaging devices, to existing customers as well as development of new accounts. He will also be selling the complete product lines for Advanced Machine & Engineering and sister company, Hennig, Inc. Chris has worked in the air gaging industry for over 10 years and has been integral in the design and implementation of measuring systems from small table top devices to automated robotic manufacturing cells. Stotz Feinmesstechnik GmbH has been a leader in gaging technology for almost 60 years. They design, manufacture and sell air-electronic gages and control devices. They are constantly striving to improve their designs and develop new products to solidify their position as a leader in new measuring technology. Numerous patents within the last few years have solidified their position as a trendsetter for new measuring technology and pneumatic measuring systems. Their diverse customer base covers many industries, including manufacturers and suppliers to the automotive, aerospace and medical industries. Hennig, Inc. design and produces custom machine protection and chip/coolant management products for state-of-the-art machine tools. Hennig products are designed to protect against corrosion, debris and common workplace contaminants. Manufacturing facilities located in the U.S., Germany, Brazil, India, Japan, China and South Korea. Repair centers are located in Machesney Park, IL; Chandler, OK; Livonia, MI; Blue Ash, OH; Mexico City, Mexico and Saltillo, Mexico. To learn more, visit www.hennigworldwide.com. Advanced Machine & Engineering (AME) in Rockford, IL, is excited to announce that they have become the exclusive North American distributor for Stotz Measuring Systems, which includes air and electronic gaging devices. Stotz Feinmesstechnik GmbH has been a leader in gaging technology for almost 60 years. They design, manufacture and sell air-electronic gages and control devices. They are constantly striving to improve their designs and develop new products to solidify their position as a leader in new measuring technology. Numerous patents within the last few years have solidified their position as a trendsetter for new measuring technology and pneumatic measuring systems. Their diverse customer base covers many industries, including manufacturers and suppliers in the automotive, aerospace and medical industries. 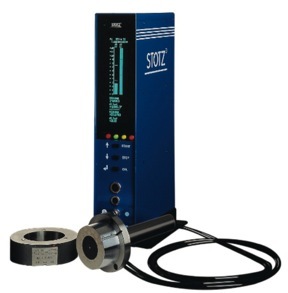 Stotz gages can be manufactured to measure I.D., O.D. out-of-round, straightness, parallelism, perpendicularity, flatness, taper, match grinding applications and many other geometric tolerances. 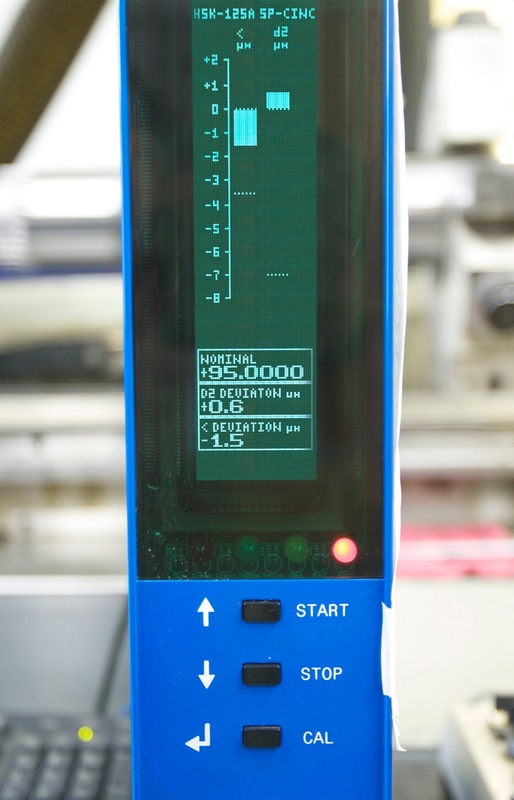 Air gaging is a very easy-to-use method of measuring and requires no special training, plus it is non-contact technology, so it does not mark the parts. The measurements are extremely accurate and very fast. There are no mechanical moving parts; therefore, air gages have a very long life expectancy. The gages, coupled with the Stotz advanced line of air-electronic columns, make the integration into a user’s measuring system an easy transition. This is true for both simple table top systems as well as more complex robotic measuring cells with feedback to machine tools as well as integrating with an SPC program. Some common parts that are measured using air gages are fuel injection components, transmission components, hydraulic components, bearings, connecting rods, crankshafts, camshafts, valve seats, hip stems, surgical screws and many different tapers such as HSK, CAT, BT, KM, Morse and Jacobs, both the male and female portions. Stotz USA, LLC, is a leader in air gaging technology, products and quality gaging system integration. According to company president, Chris Koehn, Stotz has achieved that goal by a variety of means, not the least of which has been the loyalty of good customers, who appreciate the value Stotz products brings to theirs. One of those customers is also a longtime friend of Koehn’s and he can say that with complete honesty, because he worked there, long ago. At AME, various testing of machined spindle interface and other components is performed both at the machines in the grinding department, in a temperature-controlled 72° environment, plus in the company’s totally environment-controlled in-house testing department, supervised by the company’s Director of Quality, Brad Patterson. He confirmed Greg Hobbs’ observation that numerous other technologies have been investigated over the years for quality checking at AME and that air gaging has been found to be the best and most reliable for this company’s applications, particularly ID dimensions and configuration. Patterson also observed, “The sophistication of the Stotz air column is unmatched in the industry. We get all the data required and we get it in exactly the fashion needed to support our customers. Repeatable results and elimination of error, every time. Plus, the set-up is much faster than on our laser mics, which can’t be used for ID measurement.” Patterson further noted that the replacement of the bluing technique, one he termed a “black art,” with air gaging has brought and keeps AME up to the most current industry standards for quality evaluation. Typically, as AME’s Grinding Supervisor, Sam Schubert, explains, the finished product will rest for 24 hours of soaking, allowing the diameters to normalize. Though statistically predictable for most metal materials, thermal expansion can cause off-normal readings to occur. 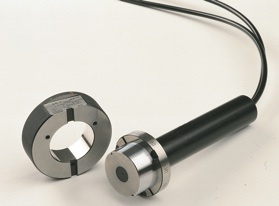 For checking certain bearing journals or spindle shafts, snap gages are set to accommodate size measurements down to the twenty millionths (0.000020”) range. The acceptable diameter tolerances for most AME products measured are in the 1-2 tenths (0.0001-0.0002”) range. Among the many products finished in this grinding department are CAT/ISO 40 taper spindles, HSK test arbors, HSK grind quills, HSK steep taper milling tools and more. 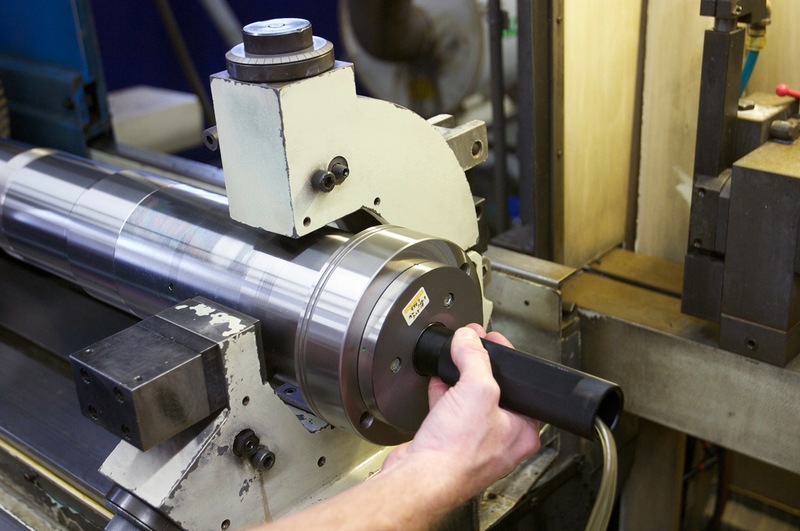 Often, older and worn spindle shafts are reverse engineered by AME for retrofits and reman’s. Even in these cases, air gaging is used to evaluate the finish process on the ID taper, as this versatile technology is easily adapted to such applications, according to AME personnel. Sam Schubert expanded on the use of Stotz air gaging at AME. “We have a full and very expensive inventory of hard gages with state-of-the-art indicators attached. But the air gages can do so much more. We use them for set-up on the grinding machines and they save us hours, every week. When you run the number of jobs we do here, that translates into substantial, additional work product and therefore more revenue for the company. In terms of reliability, some of the Stotz air gages we run here have been at AME since we began using the technology, nearly ten years ago now.” Schubert also noted the air gaging set-ups on the grinders dramatically reduce the time to first part in his department’s operation. Sam Schubert cites a useful analogy here. “The documentation we can produce from the air gaging procedure is like a birth certificate on every unit we make. All our spindle shafts for customers, for example, can be viewed as a series of genetically identical twins to each other and we’re providing the documentation of their DNA.” Quite a family. As evidence of their commitment to this technology, Schubert notes that AME is now purchasing air gaging fixtures for all new customer applications. 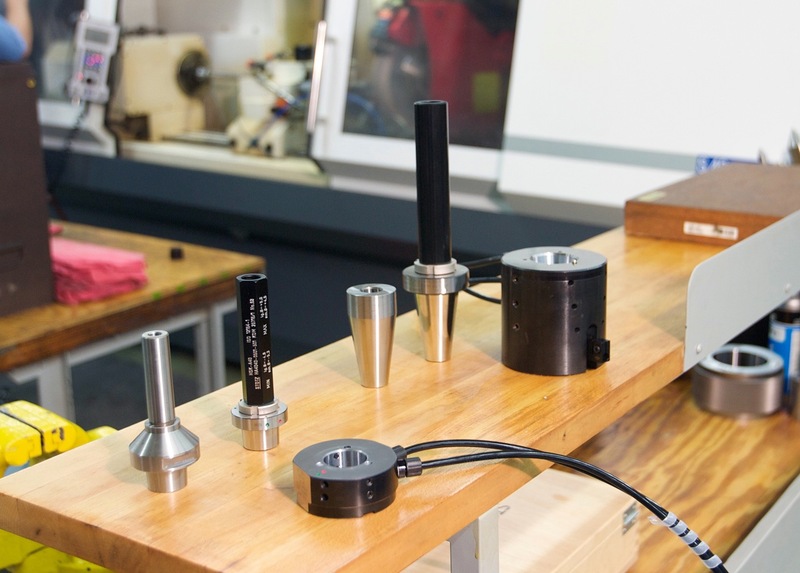 This quality spindle interface manufacturer aims to “keep breathing easy” in their process and product validation, as a result. “Stotz has been a leader in gaging technology for almost 60 years. We are constantly striving to improve our designs and develop new products to solidify our position as a leader in measuring technology. The Stotz customer base consists of the top manufacturers and suppliers in the machine tool, automotive, aerospace and medical industries,” according to company president, Chris Koehn. Harold Goellner, Vice President at AME, also contributed to this article.